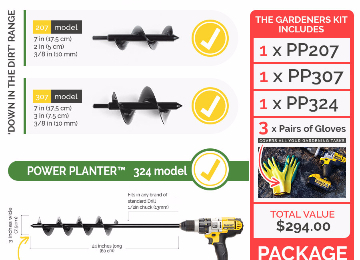 The Power Planter™ already makes digging through tough soil easy, but here are some of the ways that inventive Kiwis have used it. 1. Aerating your compost heap. The Power Planter can mix your compost heap up in seconds which you can then use to improve your garden soil. 2. Digging a Trench. If you need to lay irrigation pipe or drainage, simply drill a row of holes and then scoop out the remaining loose soil. Super Easy. 3. Making your own blend of potting mix. Use the Power Planter to combine the sand, organic matter, manures and slow release fertiliser. 4. Mixing a barrow load of concrete. Normally a hard, physical job. Instead its mixed in about 30 seconds. 5. Removing stumps. Use the Power planter to dig around the roots, loosening up the earth so it becomes easier to pull out. 6. Deep watering holes for trees. Simply drill a hole (using the 324h Power Planter) and insert some 2inch Ag Pipe into the hole. Pour water into the pipe. 7. Putting in fence posts. Make a big hole by drilling 4 holes close together and then moving sideways between them to break up the remaining soil. 8. Cultivating a whole garden bed. Just drill a 100 or so holes over the area and then move sideways with the Power Planter between the holes. 9. Bush Dunny. 60 seconds and its done (and that includes doing your business) It's so easy, you could even dig a his and hers! 10. Helping out a neighbour. See your mate breaking a sweat? 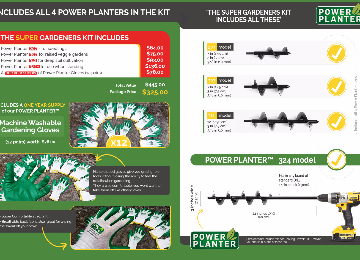 Help them out and give them a hand with your Power Planter. Because they fit on your ordinary cordless drill which most homes already have, anybody can use them. This is a revolution in gardening that is already making a lot of people very happy. 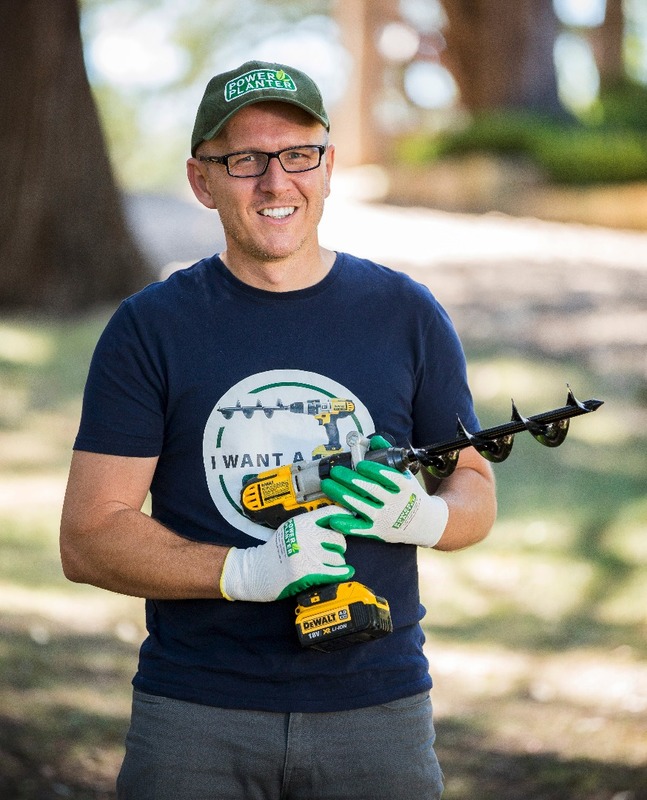 If you walk into your hardware garden tools aisle, there is a huge assortment that can be quite overwhelming, and none of them really make the job easy. Unlike other gardening tools, the Power Planter doesn't rely on brute strength to make it work. 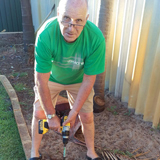 We have Men and Women of all ages successfully digging their own garden with ease. Even people with impairments are using this tool to give them the independence they long for. "What a great invention for people like me. It can be very difficult to garden from a wheelchair. The Power Planter™ has saved me suffering and a lot of pain. 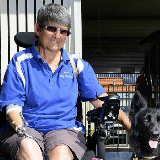 It's very easy and saves heaps of time...So if a wheelchair bound, one armed lady can use it, anyone can. Best tool in my garden shed"
"The biggest gardening mistake that homeowners make is to plant in unprepared ground." Initially the plants may look okay, but soon they start to fade and struggle. With the compacted earth we have in many Aussie backyards, it is a wonder that we can get any plants to survive at all. The important thing to know is that it isn't your fault. Too often when land is put through development, the precious layers of topsoil are removed and often our houseblocks are just solid clay and rocks. 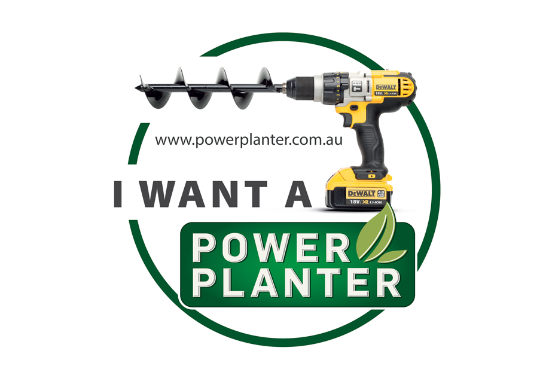 The Power Planter™ gives you the ability to work that hard ground with ease and then be able to add your compost and manures, maybe some claybreaker and mix it all in. You can turn that hard ground into a real garden that will be thriving garden in no time." Post Holes for a new deck - Not a problem! Made of solid steel and hand welded in the USA, they have a lifetime warranty on materials and craftsmanship. These really are sturdy units, built to last. 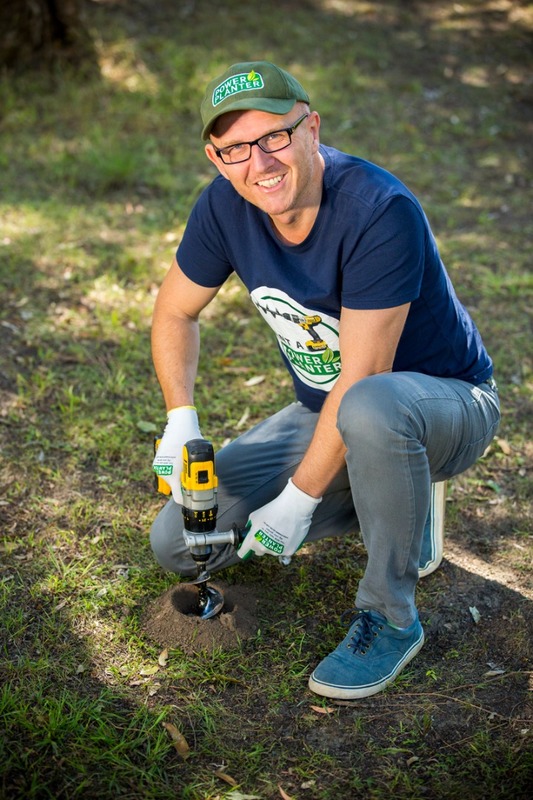 Judging by the hundreds of reviews, emails and videos being sent in from customers around Australia, it is well and truly a hit with Kiwi Gardeners. We have been missing out on this in New Zealand and we probably have some of the hardest ground of all to work with. All those years of digging with a mattock seemed like crazy hard work compared to how easy this was. This is what motivated me to bring the Power Planter to New Zealand and make it available to everyone. 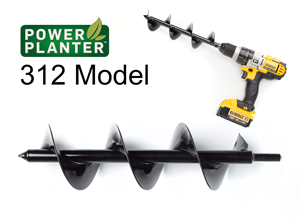 The Home Gardener Range of Power Planters are designed to fit into your ordinary cordless drill and turn it into a very effective soil digging machine. Postage and Handling is a flat rate $16.50 for all of New Zealand. Postage and handling $16.50 to anywhere in NZ. Please Note: This one requires a 13mm (1/2 inch) chuck on your drill. 90% of drills have this, but there are a few smaller models that only have a 10mm chuck. Id also recommend no smaller than a 18V drill to power this one, along with a larger capacity battery eg. 4-5A. It will work on the others but not last long. What do most people get? Extremely Happy with the product. It looks like a dream come true. Such a wonderful item invented by some genius person. Fantastic tool The power gardener is brilliant. It easily deals with general gardening demands, but its the hard stuff where the powergardener excels. Digging into and breaking up hard, rocky and clay soils is seriously a breeze with the 324H. I love it.